Wash and dry spinach leaves. Roughly chop. Heat 1 tablespoon oil in a large, heavy-based, non-stick frying pan over medium-high heat until hot. Add spinach and garlic. Toss until well coated. 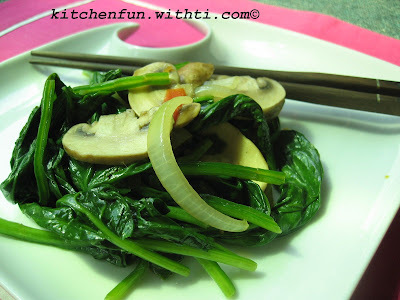 Cook, shaking pan, for 1 to 2 minutes or until spinach begins to wilt. Remove from heat. Add Mushroom, cook for further 2 minutes. Toss gently to combine. Drizzle with remaining oil and season with salt and pepper.